Figure 1. Two white jade bracelets weighing 62.305 g (left) and 69.422 g (right) with dark color patches similar to the natural skin of some nephrite pebbles. Photo by Jianjun Li. Nephrite, also called tremolite, is treasured by the Chinese for its fine texture and superior toughness. White nephrite pebbles with some areas of orange or brown skin are called zi yu. Mutton-fat nephrite jade with a natural dark brown, brown, and/or brown-yellow oxide skin is rare and considered premium quality. This skin forms due to natural weathering, and the pebble is polished within river currents. In China, nephrite enthusiasts often aspire to own mutton-fat zi yu jewelry. 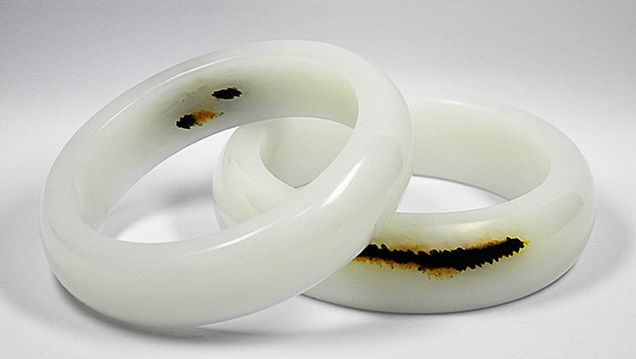 White jade that is artificially polished into pebbles and partially dyed is often seen in China as an imitation of mutton-fat jade with brown and/or orange skin. Therefore, many traders treat the white primary ore into dyed brown-orange pebbles by artificially dyeing the material. A great deal of white jade with partially dyed color is marketed as mutton-fat zi yu in the Chinese market. Recently, China’s National Gold & Diamond Testing Center (NGDTC) laboratory received from a client two bracelets with filled cavities that mimicked mutton-fat nephrite with dark brown skin. This treatment process is quite different from the traditional surface staining. Shown in figure 1 are two bracelets weighing 62.305 and 69.422 g. The white portions were pure with very fine texture. The deep brown parts, which resembled the black skin on some nephrite, were distributed along large fissures, and the sharp color boundaries were accompanied by brown and yellow materials. The black material penetrated the body of the 62.305 g bracelet (figure 2). Figure 2. Many gas bubbles and spherical pores formed from burst bubbles can be seen in the brown and black areas. Photo by Jianjun Li; field of view 13 mm. Standard gemological tests were carried out to identify the two bracelets and the deep brown and orange-yellow parts. With the owner’s permission, a dark brown portion was sampled with a knife to obtain small scrapings, which were mixed with KBr powder to form a tablet. Next, infrared spectra were collected using a Nicolet Nexus 470 infrared spectrometer with a resolution of 8 cm–1 and 64 scans per sample. With a PIKE Technologies UpIR diffuse reflection accessory, reflectance infrared spectra were collected on the white parts of the bracelets. The instrument resolution and scan count were the same as those described above. The reflection spectrum was corrected using the Kramers-Kronig method. The sample’s spot refractive index was 1.61; specific gravity ranged between 2.95 and 2.96, consistent with nephrite. The white body of the bracelets presented very weak blue-white fluorescence under a 5-watt long-wave UV lamp (365 nm) and was inert under short-wave UV (254 nm). Because of a poor surface polish, the refractive index of the brown-black part could not be measured. The dark parts showed no fluorescence. Under the gemological microscope, the white bodies presented a cryptocrystalline texture, with some obscure white areas. Dark brown patches on the bracelets appeared compact, with a slightly weak luster and grainy texture. The dark patches on the inner wall of one bracelet contained many spherical pores and gas bubbles of different sizes (again, see figure 2). This feature is common in glass or plastic imitation gemstones, but has never been found in nephrite. Spherical pores are formed from bubbles close to the surface that burst during the polishing process. The brown or dark brown dendritic pattern often found in fractures of natural nephrite (Z. Yin et al., “Nephrite jade from Guangxi Province, China,” Fall 2014 G&G, pp. 228–235) was not observed. Magnification showed that the orange-yellow and dark brown patches were artificially filled. One of the authors reported on a “filled nephrite” in 2005 (J. Li, “The identification of impregnated nephrite,” Australian Gemmologist, Vol. 22, No. 7, pp. 310–317). After careful testing, a serious mistake in that report has subsequently been identified: the direct transmission FTIR spectra with absorption bands or peaks between 3060 and 2850 cm–1 were incorrectly attributed to the epoxy resin filler. The nephrite in that report was not actually filled at all. Until now, the authors have not found a nephrite that has been bleached and filled with polymer like the B-jadeite jade. The author of the earlier study and a coauthor of the present study (JL) no longer believe that direct transmission infrared spectroscopy detects the treatment of nephrite jade. The author tried to collect direct transmission infrared spectra through the deep brown patches of the two bangles, but experiments show that these areas absorbed the mid-infrared light completely. Figure 3. Infrared spectra of the white (red line) and brown (blue line) areas of the bracelets are significantly different, with fingerprints that represent the vibration of the -OH (3674 cm–1) and the -CH2- groups (2924 and 2854 cm–1 peaks), respectively. The spectra have been vertically offset for clarity. As shown in figure 3, there was significant difference between the infrared spectra of the white body (collected using reflection mode) and the brown patches (collected with KBr powder). These clearly represent two different materials. The infrared spectrum (red line in figure 3, right) from the white body of the bracelets has a fingerprint similar to that of Italian nephrite (see I. Adamo and R. Bocchio, “Nephrite jade from Val Malenco, Italy: Review and update,” Summer 2013 G&G, pp. 98–106), except that the sample does not exhibit the absorption peak of carbonate-associated minerals. This verifies that the white part of the sample is tremolite. To identify the material in the dark brown part collected with KBr powder (blue line in figure 3, right), we searched databases containing hundreds of spectra libraries purchased by NGDTC using Thermo Scientific OMNIC 9.2 software. Materials with higher degrees of matching included allspice, cellophane, and even opium. This suggests that the dark brown material may be organic. Further advanced testing would be required to conclusively identify the dark brown material. In the 4000–2000 cm–1 range, the white part shows a spectrum peak of 3674 cm–1, attributed to the stretching vibration of the -OH groups in tremolite; the dark brown part shows a strong absorption band centered at 3429 cm–1 between 3700 and 3100 cm–1. This band is usually associated with hydroxyl groups in the polymer in organic matter. The 2924 and 2854 cm–1 peaks are often attributed to the -CH2- groups, which often appear in the spectra of organic-filled gems (e.g., E. Fritsch et al., “Identification of bleached and polymer-impregnated jadeite,” Fall 1992 G&G, pp. 176–187; M.L. Johnson et al., “On the identification of various emerald filling substances,” Summer 1999 G&G, pp. 82–107). Contamination from human fingerprints or body oils can also lead to absorption peaks within the 3000–2800 cm–1 range, but the absorption is generally weaker. 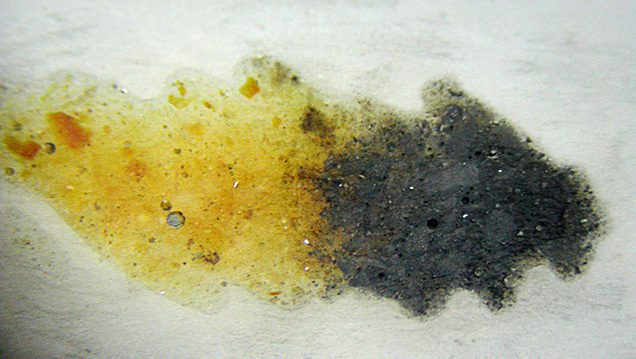 The spectrum of the white part of the sample has a very weak absorption in this region, probably due to human body fat contamination or wax residue left after polishing. This evidence indicates that the dark brown and orange parts of the samples are fillers. But this filling is obviously different from that in B-jade, where polymer is flooded between the grain boundaries. The filling in these two nephrite bracelets looks more like that in single-crystal gems. Therefore, we propose that the nephrite used in these bracelets had severe pits or cavities, and fillers were used to fill them and make the surface look smooth. The authors want to alert the trade and consumers to this new treatment, whose detection requires access to gemological instruments. Therefore, bringing your nephrite jewelry to a gem laboratory can help avoid unnecessary loss. Jianjun Li and Guihua Li are with the National Gold & Diamond Testing Center in Shandong Province, China. Haixia Chen is affiliated with the Gemstone and Materials Technology Institute, Hebei Geoscience University, China. Analysis of 21 rough and gem-quality samples offers an update on the composition and properties of this pale green gem from the Italian Alps. The "bleaching" treatment of jadeite jade has become prevalent in higher- as well as lower-quality material.